Bonsai trees have a bit of a reputation: finicky, slow-growing, difficult to manage, susceptible to disease—the list goes on. To put it nicely, most people think of bonsais as one of the most challenging plants to care for. It’s a reputation that’s not entirely undeserved, but with the right tools and knowledge, we’re confident that just about anybody has what it takes to help these handsome little trees thrive. So what’s a bonsai, anyway? The literal translation of the Japanese word bonsai means “grown or planted in a container,” and it’s a practice that’s been popular in much of Asia for many centuries. Bonsai does not refer to a specific type of tree; they can be grown using virtually any kind of tree species. Some of the most popular include junipers, Japanese maples, jade trees, and ficus trees. The common factor among all bonsais is that they’re placed in a small container to purposefully stunt their growth, which keeps them miniature for their entire life. Why are bonsai’s so challenging? Taking care of a bonsai tree isn’t challenging because of the amount of work required—the difficulty usually stems from a lack of knowledge. They are persnickety plants that can decline and die quickly if they aren’t taken care of properly. The environment and maintenance schedule are key: Temperature, light, humidity, watering, and pruning are the main factors, but it’s important to keep in mind that since bonsais can be different species of trees, their needs can change. What do I need to know to get started with my own bonsai? Bonsais typically require more water than most plants of a similar size. In fact, not having enough water is the primary reason bonsais die. If soil is dry to the touch, your bonsai needs water—and it’s important to give it water until it starts dripping through the drainage holes in its container. If you overwater, it’ll become apparent quickly as leaves will turn yellow. Pruning tends to be much more important with bonsais than other plants. It allows you to not only shape the plant in an aesthetically pleasing way, but also encourages strong growth in the right areas. Removing fledgling branches and leaves will allow extra light and oxygen to reach established growth, and will help the tree stay the right size. Also, removing buds can help weaker leaves grow bigger. 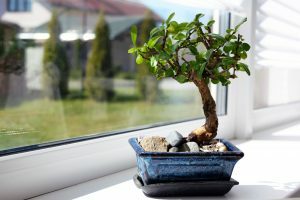 Since bonsai trees grow in a limited space, you’ll need to keep an eye on your plant every day to make sure it’s not outgrowing its container. If it is, prune away! Most people think bonsais are indoor plants. But actually, many species of bonsai, especially coniferous trees, can do great outside when weather conditions aren’t extreme. If you want your plant to stay indoors, make sure you get a species like Chinese elm or jade trees that will do well in that environment. Bonsai trees don’t do well in breezy areas. They also don’t like intense heat. Keep them in a temperate spot that gets ample sunlight, and make sure the environment is somewhat humid, as dry air can damage them. Pick a soil that drains easily. While it should hold some water, it’s important your soil doesn’t retain too much moisture as this will suffocate the root system and breed disease. Many companies make fertilizer specifically for bonsai trees. This can be a great tool for helping to make sure your bonsai is getting all the essential nutrients it needs. Ok, I’m ready for the challenge. How do I get started with bonsai gardening? We recommend getting a mature bonsai tree if you’re an inexperienced bonsai gardener, which you can find at most home and garden stores. While a bonsai can be quite expensive—especially if it’s a larger, more intricate tree—it’s good to start with a smaller one that won’t need as much pruning. You should be able to find a smaller, mature tree for between about $15 and $30. Next, you’ll need the right supplies. A small pair of pruning shears is a must, and so is a watering can (preferably one that lets you measure the amount you’re using). If your bonsai is indoors, you’ll probably also want some sort of mat or covering to put between the container and the surface it sits on. Optional supplies include bonsai fertilizer, and a light/soil pH meter which can help ensure your tree is getting enough light and that the soil has the right level of acidity. For many people, bonsai gardening is a relaxing, rewarding escape from the hustle and bustle of daily life. If it sounds like a fulfilling experience, we think you should give it a shot. Luckily, there are tons of resources you can take advantage of to get your questions answered and improve your skills. 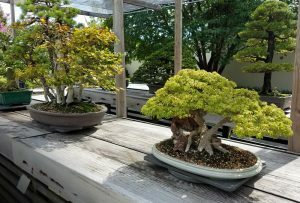 One of our favorites is the Indianapolis Bonsai Club, but you can also check out the American Bonsai Society for lots of great info. If you couldn’t tell already, all of us at Engledow absolutely love talking about plants. If you’re interested in learning more about our services—including lawn care, landscape design for your home and your business, or our interior plant program—we’re ready to chat. Contact us today! This entry was posted in Interior and tagged Featured by Eric Engledow. Bookmark this link. Five ways to add beauty and functional space to your office landscape.